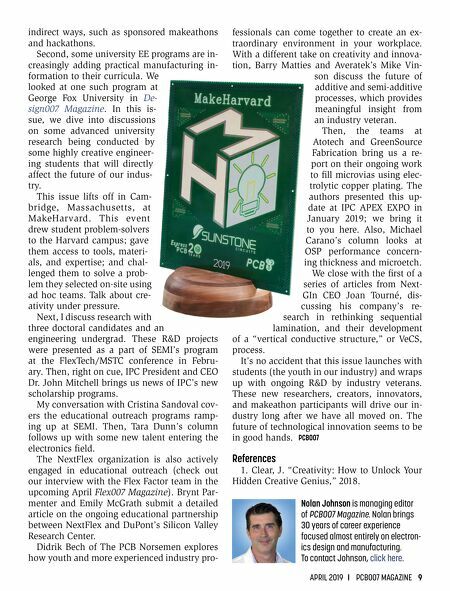 APRIL 2019 I PCB007 MAGAZINE 9 indirect ways, such as sponsored makeathons and hackathons. Second, some university EE programs are in- creasingly adding practical manufacturing in- formation to their curricula. We looked at one such program at George Fox University in De- sign007 Magazine. In this is- sue, we dive into discussions on some advanced university research being conducted by some highly creative engineer- ing students that will directly affect the future of our indus- try. 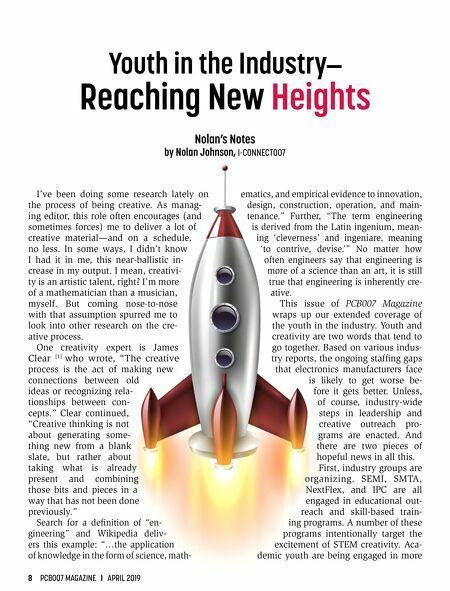 This issue lifts off in Cam- bridge, Massachusetts, at MakeHarvard. This event drew student problem-solvers to the Harvard campus; gave them access to tools, materi- als, and expertise; and chal- lenged them to solve a prob- lem they selected on-site using ad hoc teams. Talk about cre- ativity under pressure. Next, I discuss research with three doctoral candidates and an engineering undergrad. These R&D projects were presented as a part of SEMI's program at the FlexTech/MSTC conference in Febru- ary. Then, right on cue, IPC President and CEO Dr. John Mitchell brings us news of IPC's new scholarship programs. My conversation with Cristina Sandoval cov- ers the educational outreach programs ramp- ing up at SEMI. Then, Tara Dunn's column follows up with some new talent entering the electronics field. The NextFlex organization is also actively engaged in educational outreach (check out our interview with the Flex Factor team in the upcoming April Flex007 Magazine). Brynt Par- menter and Emily McGrath submit a detailed article on the ongoing educational partnership between NextFlex and DuPont's Silicon Valley Research Center. Didrik Bech of The PCB Norsemen explores how youth and more experienced industry pro- fessionals can come together to create an ex- traordinary environment in your workplace. With a different take on creativity and innova- tion, Barry Matties and Averatek's Mike Vin- son discuss the future of additive and semi-additive processes, which provides meaningful insight from an industry veteran. Then, the teams at Atotech and GreenSource Fabrication bring us a re- port on their ongoing work to fill microvias using elec- trolytic copper plating. The authors presented this up- date at IPC APEX EXPO in January 2019; we bring it to you here. Also, Michael Carano's column looks at OSP performance concern- ing thickness and microetch. We close with the first of a series of articles from Next- GIn CEO Joan Tourné, dis- cussing his company's re- search in rethinking sequential lamination, and their development of a "vertical conductive structure," or VeCS, process. It's no accident that this issue launches with students (the youth in our industry) and wraps up with ongoing R&D by industry veterans. These new researchers, creators, innovators, and makeathon participants will drive our in- dustry long after we have all moved on. The future of technological innovation seems to be in good hands. PCB007 References 1. Clear, J. "Creativity: How to Unlock Your Hidden Creative Genius," 2018. Nolan Johnson is managing editor of PCB007 Magazine. Nolan brings 30 years of career experience focused almost entirely on electron- ics design and manufacturing. To contact Johnson, click here. Feature Column — Merging the Best of Both Worlds: Young Superheros and Knowledgeable Wizards!